Hi Daniel, <BR> <BR>that&acute;s exactly why I call it a serious thing 8-&#41; Well done... <BR> <BR>Regards, Alexandr. Ises! <BR>Dis Bionic Delay is a real irie t'ing fe mek authentic classical dubbin' echochamber sound dem. <BR>An' wid playing wid "feedback" while echoes a soundin' yuh fe get real ruff naize dem. &#40;Low cut to the far left, high cut to the middle, groove: <BR>between 40 and 70, wid any note value.&#41; <BR>Dis ya mek me ear dem real HOT ! <BR>Keep up dat wine wuk ! <BR>Cool runnings ! Love your stuff mate. <BR> <BR>Seems your delays keep the attack of the sound more than Logics tape delay. WOW interruptor... I gotta thank whoever it was that encouraged you to create this. 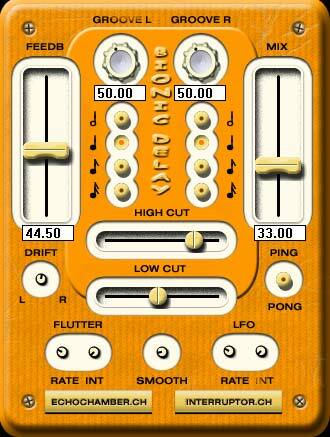 I have been looking for a VST clone of the Logic tape delay for ages. My copy of Ableton Live was just not complete without this beauty. I would echo &#40;hehe&#41; the sentiment of DJaXXz about the placement of the filters but who cares right now I'm gonna enjoy some beautiful saturated dubby goodness in my headphones. <BR> <BR>PROPS! Now off to love it and hug it.